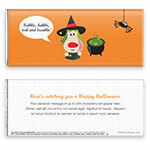 "Witch" wrapper to choose this Halloween? This one, of course! This charming, whimsical wrapper is a great choice for your Halloween invitations or as a special gift for "frightful" friends. 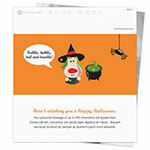 Design: Halloween witch with bubbling cauldron and spider. Personalization: Front message bubble, back title and message.